These 9V batteries are poor performers & costly. IMHO humble AAs, although larger,are far superior & DIRT CHEAP. 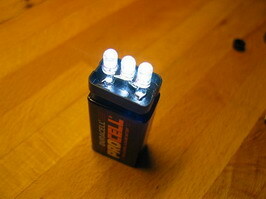 You can hack a cheap 3 x AA switched battery box & fit a white LED for ~ US$2 all up (including batteries). It’ll still be giving out light nearly 1000 hours later too! Shure, you can make it every way you want – My intention is to let people think (and you did – THANK YOU). But I have had my 9V battery lamp in 2 years now (as a emergency lamp – not light every day) and the battery is still fresh – I think this is compact, simple solution of a handy lamp.